With just a few clicks you can turn a completed job into an invoice - timesheets, materials and receipts are automatically transformed into an invoice so every cost is accounted for. You won't need to worry about missing invoices, unentered billable hours and late payments any longer. Time, materials and expenses are all automatically imported into your invoice so nothing gets missed. 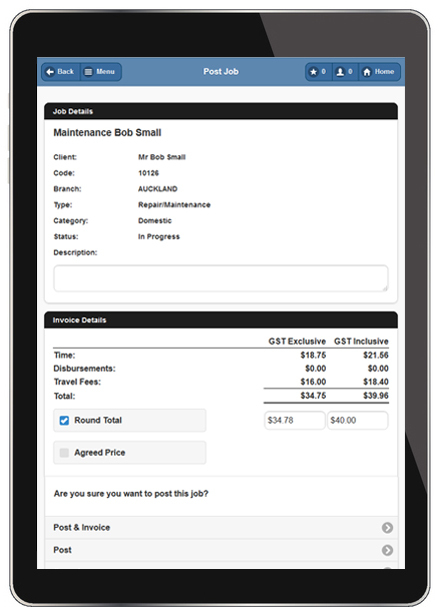 TimeTrak allows you to raise invoices in the field, helping you bridge the gap between job completion and payment. Get your cashflow and your business back on track. Take back control of your business financials so you can focus your time where it matters most. TimeTrak's report designer allows you to create customised reports and invoices with ease. With a library of templates, creating invoices that reflect your business’ unique branding is fast, simple and professional. Read more about Custom Reports & Invoices. TimeTrak integrates with MYOB ERP systems to keep your accounts in the loop, so you stay on top of your finances. Why re-enter invoices when TimeTrak sends completed invoices directly into your accounting system so your finances are kept up-to-date and accurate across both systems. Client and supplier updates, purchase orders and payments can all be shared between TimeTrak and your ERP software. No more time wasted on double entry of data.